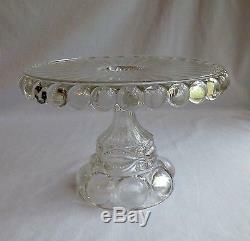 Dalzell Gilmore & Leighton Eyewinker Pedestal Cake Plate. 9 3/4 inches wide, 9 inches of flat surface for the cake. About 6 1/2 inches high. 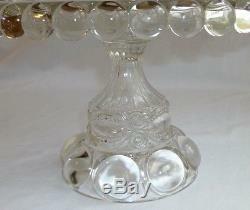 Made by Dalzell Gilmore & Leighton Glass Company 1889. A great display for your special cakes. Condition: No damage at all. The surface has a bit of scratches as would be expected. Dinnerware Classics Monroe, Georgia, USA. Remember our shop for new, old, and antique dinnerware. Include our retail sticker intact and in the same condition as received. 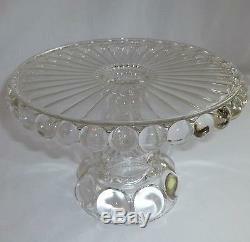 The item "Eyewinker Clear Glass Pedestal Cake Plate, Dalzell Gilmore & Leighton Co" is in sale since Friday, November 9, 2018. This item is in the category "Pottery & Glass\Glass\Glassware\EAPG Pattern Glass 1850-1910\Other EAPG Patterned Glassware". 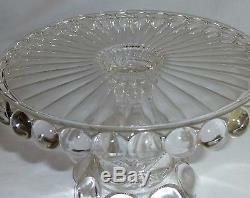 The seller is "dinnerwareclassicsinc" and is located in Monroe, Georgia. This item can be shipped to United States, Canada, Australia.